You could say Richie Petitbon III's senior year took a dramatic turn. He was an offensive lineman on the Gonzaga Eagles football team, which won the DCSAA championship for all Washington, D.C. public and private schools. He was named Gatorade Player of the Year for the city, made All-America teams, and was regarded by scouting service 247Sports as the no. 5 guard prospect in the nation for the class of 2015. On Feb. 4, National Signing Day, he officially accepted Nick Saban's offer to play at Alabama. At the time, his 6-foot-4, 315-pound personage was already coming off the bench to clog the middle for the Eagles basketball squad, which two weeks ago defeated permanent powerhouse DeMatha in double overtime to win the title in the WCAC, the league for D.C.-area Catholic schools and long the strongest prep hoops confederation in the country. Petitbon was also the second-leading scorer on the school's 2014 lacrosse squad, which headed into this season as the top-ranked team in the nation, and on Tuesday lived up to the previews with a 13-6 rout of last year's national champions, Boys Latin of Baltimore. "It's been an awesome year. Just awesome," Petitbon tells me, as I read aloud a few of his gridiron, lax and hoops highlights. "I'm so lucky, so grateful." But ask Petitbon to cite his awesomest high school experience, and he won't mention playing tackle, power forward, or attackman, though he'll ooze earnestness while saying how much he loved all of those. He'll also slight his having earned a black belt in tae kwon do, being vice president of his class, anchoring the daily morning newscast for Gonzaga's in-house TV station, and being named "Teen of the Week" by the Capital Gazette, an Annapolis community paper that ran a profile of Petitbon in the fall headlined "Teen Demonstrates the Power of Being Nice." 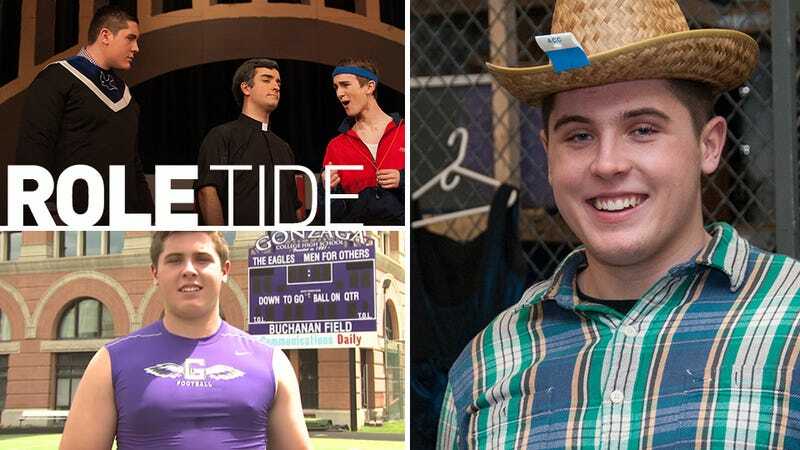 Nope, Petitbon will tell you the favorite role he's played while becoming the biggest man on the prestigious prep's all-boy campus is also his latest: "Wes Warnicker." That's the buzz-killing uncle character from Footloose: The Musical, a current production of the Gonzaga Dramatic Association. The show closes this weekend at Gonzaga's on-campus theater. It turns out that as the curtain began falling on his high school career, Petitbon added thespian to his already ridiculous résumé. His math teacher, Paul Buckley, who doubles as GDA's faculty advisor, challenged Petitbon to audition for the annual spring musical. Despite his only previous acting experience involving imitating WWE wrestlers at home with his brothers, his only singing taking place "in the shower," and having not danced outside some steps at last year's Gonzaga homecoming and prom, he accepted. And he got the gig as Wes—one of the grownup roles. So he spews spoken word lines about the evils of singing and dancing in the first act, then has a change of heart in the final stanza, and joyously sings and dances in big production versions of the theme and "Let's Hear It for the Boy." "I wish I'd have done it before. It's awesome," he says, with unscripted enthusiasm. Just how thin Petitbon has stretched his large self becomes obvious this weekend, when several of his worlds collide. The WCAC title earned the basketball team an invitation to the Alhambra Tournament in Cumberland, Md., long one of the nation's most prestigious postseason tourneys for Catholic preps. And the lacrosse team has tournament obligations of its down, competing alongside every other boys high school lacrosse team in the city at the DC Classic. And Footloose will have its last performances. Something had to give, so Petitbon begged off the basketball tournament and decided to stay in town for the other extracurriculars. On Saturday, he'll be with the lacrosse team when the Eagles face off against St. Albans in the upper Northwest section of town at 3 p.m. Then he'll shed his pads, shower up, and head to Gonzaga's campus near Capitol Hill to get in costume for the closing night of Footloose, with a 7:30 p.m. showtime. "It's going to be tight, but I know Troy Bolton played in the big game then ran off to be in the play, too" says Petitbon, referencing the lead male character in Disney's High School Musical. "Only this is real." Gonzaga was opened by Jesuits in 1821 as part of what is now Georgetown University, and has quite a colorful history. (Among its alumni is David Herold, who 150 years ago this spring was hanged for helping plot the assassination of President Abraham Lincoln.) The campus sits just a few blocks from the U.S. Capitol building, and over time the school has gotten lots of attention for grooming Irish-American boys who later went into the local industry, politics. A couple of the best known Gonzagans, in fact, were fuddy-duddies who tried to impose an arcane world view on our country that Wes Warnicker would approve of. There's Pat Buchanan, whose political career was lowlighted by his 1000 Points of Hate presidential campaign of 1992, a year in which he blamed the Rodney King riots on "rock concerts where rap music extols raw lust and cop-killing." And William Bennett, who became the nation's first drug czar under President George H.W. Bush and is still fighting the War on Drugs with a new book, Going to Pot: Why the Rush to Legalize Marijuana Is Harming America. In 1995, Bennett actually put out a "hit list" of rap tunes he wanted banned, including works of Tupac Shakur and the artist then known as Snoop Doggy Dogg, and bought advertising time on radio stations to get his anti-rap message out. The less crusty and more THC-friendly Martin O'Malley, a former governor of Maryland now touted as a potential Hillary Clinton spoiler, is also an alum. The school's drama program has historic airs, also. It's been putting on plays since the 1820s, and has been using the same building, now called the Sheehy Theater, since the late 19th century. "Our theater is the oldest continuous running theatre in the city," says Buckley. But after nearly two centuries of athletic irrelevance, Gonzaga has very recently become a schoolboy sports powerhouse. The football program produced current NFL players A.J. Francis of the Miami Dolphins, Cam Johnson of the Indianapolis Colts, and Johnson Bademosi of the Cleveland Browns; Kevin Hogan, who succeeded Andrew Luck as quarterback at Stanford and took the Cardinal to two Rose Bowls, might follow soon. March Madness should feature both Nate Britt of North Carolina and Kris Jenkins of Villanova. The name Richie Petitbon is also full of history, lots of it local and from well before Richie III was born. His grandpa, Richie Petitbon I, was an NFL badass as a player, a four-time Pro Bowler as a safety with the Chicago Bears in the 1960s whose 37 career interceptions still rank second in franchise history. Petitbon picked off a pass in the end zone from Y.A. Tittle of the New York Giants to seal the Bears' win in the 1963 NFL championship game, and grabbed another 11 picks after he followed coach George Allen to the Los Angeles Rams and the Washington Redskins. He went into coaching after retiring as a player in 1972, and became a Skins legend as defensive coordinator during the team's three Super Bowl-winning seasons; he was likely the only assistant coach in the NFL in the 1980s beloved enough to have his own chain of eponymous restaurants, which he did. Petitbon was given Washington's head coaching job in 1993, but Joe Gibbs had left the cupboards bare when he abruptly retired, and Petitbon was fired after posting a 4-12 record as owner Jack Kent Cooke brought in hot offensive coordinator Norv Turner from the Dallas Cowboys. The Skins franchise has never recovered from the Turner era, though fans thought he'd gotten shafted by Cooke and long ago absolved Petitbon of any blame for its demise. Richie Petitbon II, meanwhile, starred at Madison High in Vienna, Va., in the 1980s, and had a decent career as a linebacker at the University of Maryland, highlighted by a game-saving interception of a Bernie Kosar pass in the Terps' 42-40 win over Miami in 1984—at the time, the greatest comeback in NCAA history. Richie II lamented to the Washington Post's Michael Wilbon after that big play that the only "notable achievement" listed in the Maryland media guide under his name was "son of Washington Redskins defensive coach." He admits happily trading on the father's name after college, when he started a home security firm with the slogan "Defense, a Family Tradition." So it was that three generations of football players named Richie Petitbon were in the Sheehy Theater for Sunday's matinee of Footloose. The older guys embraced the artistic turn of the kid the family calls Little Richie or RP3, though Richie I was unsure that artistic exploration was what really motivated his grandson, teen of the week or not, to take up show tunes. "When I told Dad that Little Richie was doing the play, he says, 'I bet there's a bunch of girls in it,'" Richie Petitbon II says. "He knows he goes to an all-boys school. I said they got lots of 'em. 'He's not stupid,' Dad says." Petitbon leaves for Tuscaloosa in late May, and will commence college classes a week before his high school graduation. "He's coming back for the ceremony, then going straight back to Alabama," says Richie II. "No senior trip or beach week or summer of frolicking for him. But that's what he wants." While his next school is the place where Bear Bryant molded Broadway Joe Namath, Petitbon figures it's doubtful he'll get much in touch with his inner Tommy Tune at Alabama, at least early on. "Oh, I dunno," he says when asked about the short-term prospects of his acting career. "Coach Saban's pretty strict." So let's hear it for the boy now. Because in SEC football, when somebody tells him to break a leg, it'll mean something entirely different.